At the unlikely intersection of pizza, werewolves, and Chance the Rapper lies Slice, A24's horror-comedy about a town full of supernatural beings plagued by a series of murders turning living people into ghosts. With a cast that includes one of the biggest musical artists in the country, you'd think Slice would be the kind of midnight movie perfect for after-hours screenings capitalizing on the creepiness of Halloween month, a.k.a. October. A24, the studio behind the likes of Hereditary, Eighth Grade, and Moonlight, is usually fairly loyal to their acquisitions, no matter how weird, so why does it seem like they're doing everything they can to bury this one? Well, it's pretty simple, actually: Slice is, unfortunately, not that great. 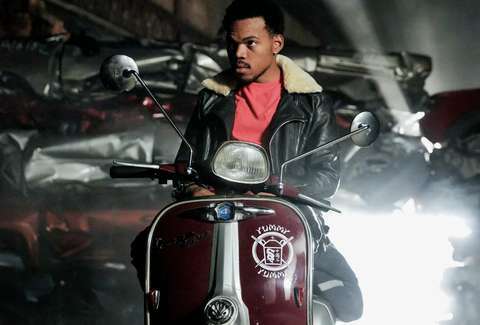 Slice's release has been hyped ever since it was announced three years ago that Chance the Rapper had been cast in his very first film role, directed by Austin Vesely, with whom he's filmed two very charming, weird music videos for Chance's songs "Angels" and "Sunday Candy." In August, preceding its release, A24 mocked up three posters parodying classic pizza chains like Little Caesars, Pizza Hut, and Domino's, which is a fun bit that would have worked great if the movie was as entertaining as it sounds. With very little fanfare, A24 then dropped the movie to on demand platforms a day after its special "one night only" theatrical engagement on September 10. Sometimes that's kind of fun, especially when whatever's being dropped is exciting and cool, but Slice, which is now available to rent on iTunes and on Amazon, is more of a Cloverfield Paradox than a Lemonade. The town of Kingfisher is home to a diverse array of beings: humans and ghosts coexist in separate parts of the town, the spirits relegated to a "Ghost Town" per legislation segregating the living from the dead (and undead). Perfect Pizza delivers to all citizens of the town, dead or alive, to the misfortune of a number of its delivery drivers who are unceremoniously offed by a mysterious killer and turned into ghosts themselves. The mayor (played by Chris Parnell) has to contend with a group protesting the ghost gulag and advocating for Perfect Pizza to be torn down, there's a witch coven pulling strings behind the scenes, and, worse, word on the street is there's a werewolf named Dax Lycander (Chance Bennett) loose in the town, and many think he might be the one committing these deadly crimes. A number of youngsters set out to try to solve the mystery: Astrid (Atlanta's Zazie Beetz), the smartmouthed delivery gal of Perfect Pizza; Sadie Sheridan (Rae Gray), a wide-eyed young journalist with a nose for mysteries; and Jackson, a photographer played by Stranger Things' Joe Keery, who is given next to nothing to do. Honestly, this movie, with its colorful low-budget aesthetic, love of monsters, and weird combination of B-movie horror tropes, should have been much more fun than it is. Vesely takes the concept of "What if the "Thriller" music video actually was a full-blown B-movie?" and really runs with it, but something just doesn't stick. The main problem with Slice, other than the many jokes that don't land, is how needlessly complicated the plot is. There's a drug lord named Big Cheese, a witch coven, a ghost gulag, prejudice against said ghosts, prejudice against supernatural beings in general, a portal to hell, and a murder mystery to loosely tie all these things together. It's a lot to cram into an 83-minute horror-comedy with an '80s-pastiche aesthetic that begs for a cult VHS release ten or fifteen years from now. It becomes work to watch -- I found my eyes sliding over to the Wikipedia summary a couple of times just so I could keep up with the plot. What should be the most fun aspect of the movie is that it's clearly made by a director of music videos that have a certain flair. "Angels" involves Chance scooting through the sky wearing a pair of animated goggles, and "Sunday Candy" was filmed on a stage in seemingly one take with rolling sets made of wood and painted to look like locations from a school play. There are smoke machines and neon lights all over Slice, and the ghosts are simply actors with their faces done up with Halloween store paint and dark eye circles -- which is actually a pretty funny bit. There's a low-budget style to the movie that I respect, that's all the more jarring when the finale gets to the special effects light show. While Vesely clearly has an eye for style, he fails to back it up with a story that's as fun to dive into as its, frankly, dope opening credits promise it to be.